2 Bedroom Condo at Waikoloa Beach Resort with Ocean Views, Swimming Pool, Close to Beaches & More! 303 Shores at Waikoloa Beach Resort provides visitors with a truly unique Hawaii vacation experience. 303 Shores features two bedroom suites, two full bathrooms and plenty of room for as many as six guests. Waikolola Beach Resort offers two tennis courts, fitness center, a resort-style swimming pool and hot tub with a BBQ area. Every detail of this property remodel was well thought out. The remodel reconfigured the layout to maximize openness. The coffered ceilings with recessed lighting, ceiling fans in all rooms and dimmer lights gives a sense of elegance. The flooring throughout is a beautiful hard wood and designer tile. Quality finishes throughout down to the paint. A spacious living room, dining area and kitchen flow seamlessly together, making this a great entertaining home. Foodies alike will appreciate the gourmet kitchen with its state-of-the-art appliances and plenty workstations for preparation. 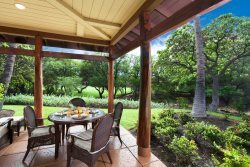 Adjacent to the kitchen is a large 600 square foot covered lanai with panoramic views of the ocean and golf course and stargazing during the tropical evenings is an experience not to be missed! Casual barbeque meals are the perfect way to take in the spectacular views and there is a dining table for six, and two loungers allows plenty of room for all to soak up the Hawaiian sun. Relax and unwind in the large welcoming master suite while lying in the king memory foam bed. The bathroom offers double sink and makeup vanity, a spacious walk-in shower, and plenty of drawers and storage space to make you feel right at home. The guest suite features two queen Novaform memory mattresses, a flat screen TV, and a sliding door to the lanai. Minutes drive to the Queens’ MarketPlace and Kings’ Shops for grocery shopping, restaurants shops and more. The Hilton is approximately a 5-minute walk, while the Marriott is approximately 10-minutes. Anaeho’omalu Bay, also known as A-Bay is less than a mile away with ample parking. More world class beaches are within a 15-minute drive. It was a pleasure, easier than booking a hotel.